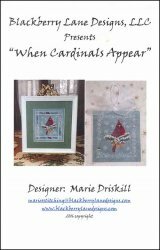 When Cardinals Appear [G1101] - $15.00 : Yarn Tree, Your wholesale source for cross stitch supplies. Cross stitch pattern by Blackberry Lane Designs. A cardinal perched on a snow covered pine tree branch with pine cones hanging. Snowflakes fill the sky. Stitch count framed design 75w x 80h and ornament 67w x 71h.